Due to the high costs of catalysts containing active ligands and rare metals, their retention in continuous processes is extremely valuable. Entrapping the homogeneous catalysts in surfactant micelles “heterogenises" them so they can be separated more easily, e.g. by ultrafiltration. Micellar enhanced ultrafiltration (MEUF) has so far mainly been investigated for application in water treatment or other aqueous systems (e.g. Fig. 2). A comprehensive screening (a) for the most suited membrane to separate the w/o emulsion with reverse micelles (see Fig. 1) after hydroformylation and (b) under conditions that allow scale-up is still pending. In this work, we investigate the ultrafiltration of reverse micellar solutions in order to find the most suited membrane material. Operating conditions such as cross-flow velocity, temperature, flux or transmembrane pressure shall then be optimised in terms of maximum micelle or catalyst retention. Moreover, for an efficient process design, a practical and reliable flux and retention model shall be developed. Finally, the MEUF step will be coupled to the reaction step to obtain an optimised integrated process. UF membranes with different molecular weight cut-offs (MWCO, 5-10 kDa) were used for the filtration of water-oil (w/o) or oil-in-water (o/w) microemulsions containing 1-dodecene, water and a non-ionic surfactant (e.g. 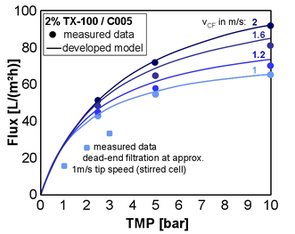 Marlophen NP5 and NP9) in a dead-end stirred cell under the same operation conditions (at 3 bar pressure, 25 °C temperature and 200 min-1 stirrer speed). Most of the commercial membranes, e.g. RC (regenerated cellulose) and PES (polyethersulfone) proved to be unsuitable for the w/o MEUF due to their chemical instability. 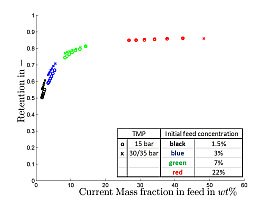 In addition, during the reverse MEUF, the filtration performance of stable membranes, e.g. PAN (polyacrylonitrile) and PA (polyamide), was found to be much more inefficient (see Fig. 4) than during the o/w MEUF (see Fig. 3). Due to this observed inefficiency, process alternatives were being evaluated and the fundamentals of physical phenomena during w/o MEUF as opposed to o/w MEUF were investigated. Since o/w MEUF has proven to be applicable (see. Fig. 3), it could be used as one stage in the within the alternative downstream processing concept in order to purify the aqueous phase of the phase separation step. 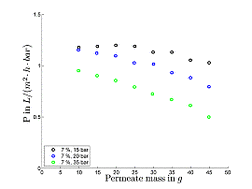 Thus evidence has been found, that the concept of MEUF of the ternary mixture 1-dodecen/ water/ Marlophen NP5 is infeasible, because it leads to negligible micelle retentions and low permeabilities due to adsorption of the non-ionic surfactant on the membrane. Since experimental results showed, that due to an efficient phase separation the concentration of Rh was at about 1ppm and below, further investigations focusing on the retention of micelles and Rh within was no longer necessary. Because of high surfactant concentrations in the organic phase after the first phase separation step (approx. 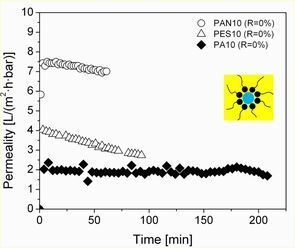 10%) organic solvent nanofiltration was investigated as means to separate the surfactant (Marlipal 24/70) from the organic phase. 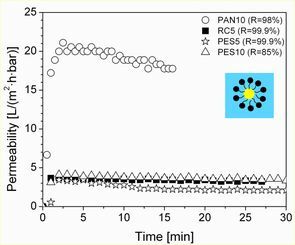 First experiments using a dead-end stirred test-cell at 15-35 bar and with the binary system 1-dodecen/ Marlipal 24/70 (non-ionic surfactant) showed general feasibility of organic solvent nanofiltration, since surfactant retentions of up to 86% could be achieved at reasonable permeabilities (for organic solvent nanofiltration) of approx. 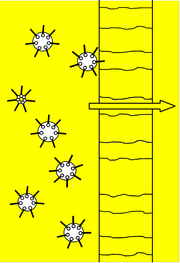 1 L/(m² h bar) as can be seen in Figures 5 and 6.